The My Account menu lets you manage your organisation, users and billing. This is also the area that lets you customise the look of your organisation on the mobile app. When you click on the ‘Menu’ (the link found in the top right of every page), you can enter the Organisation Setup screen. This screen lets you maintain your organisation name and location, upload your company logo and letterhead, and access global settings for use with integration and connectors. The Send Email From field allows you to specify a custom sender email address. This is the address that will show as the sender on any emails you send from the platform, such as user invites and data file emails. The Integration Passkey field is a unique, generated key for use with the integration API (programmer interface). If you plan on using the integration API, this is an important value that your technical personnel will need to know about. If you are not using the API, then you can ignore this field. 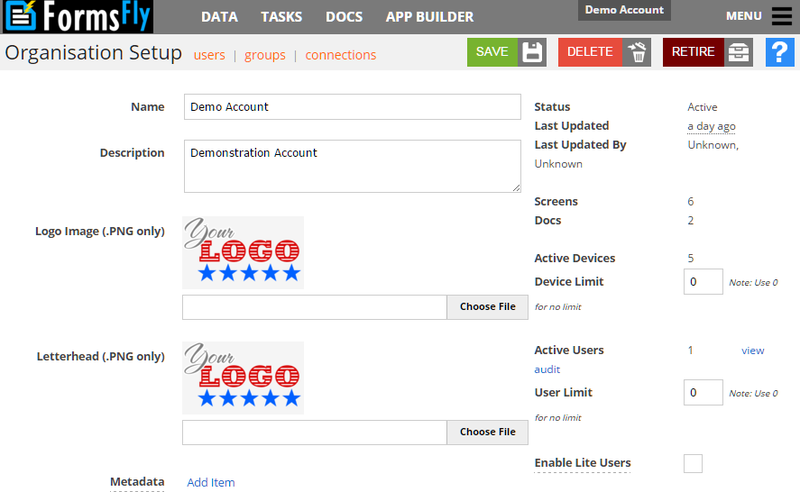 In the options bar you will find functions to manage your users and user groups. FormsFly Web Platform Gets a Facelift!. Manage Users.